Mt. Auburn is collecting gently used or new shoes now through May 10th! Making disciples is what we do. Discipleship is more than evangelism; it’s teaching, training, encouraging, correcting, and loving other believers to express greater faith and obedience to Jesus Christ. Discipleship is living out our faith together, in Word and deed! One of the ways Mt. Auburn is involved in discipleship is through its relationship with Christ Youth Bible Club. CYBC is an organization that equips Christians to engage children in our local elementary and middle schools. Children come before or after school and participate in small and large group discussions that are educational and Biblically-based. Now through May 10th, CYBC is hosting a shoe drive through an organization called Funds2Orgs, which will support and provide an inventory for micro-businesses in the developing world. In countries such as India, Haiti, and Uganda, micro-entrepreneurs receive and clean the shoes, making them like new and sell them within their local communities. This process helps lift them and their families out of poverty. You can help them and CYBC by cleaning out your closets, donating your new or gently worn shoes, and asking your friends and neighbors to do the same. SHOES MUST BE IN GOOD CONDITION! They can be bundled together with a strong rubber band or shoelaces tied together. 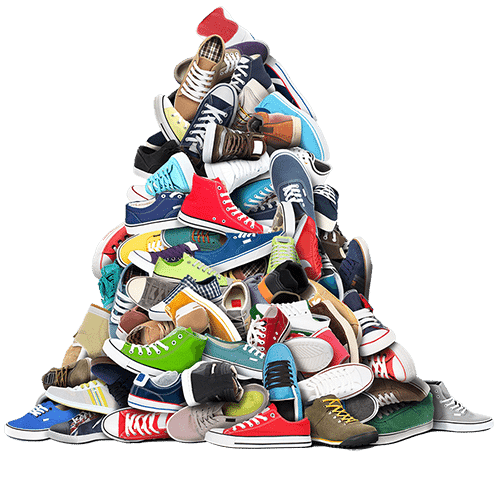 Shoes can be dropped off at our “Shoebox” located next to KidCheck near Door #1 (outside The Chambers) or the Shoebox in the foyer at Trafalgar UMC. More information online regarding Funds2Orgs or Microenterprise.